This is a jointed bear and the joints seem to move freely. Teddy Bear in a sitting position. A plush. Please Read :Payment:I accept Paypal only and payments are due within 3 days after winning the bid. For Sale. I do strive to note any and all flaws, but I don't always catch everything. This bear is in excellent condition with beautiful curly hair and he's very clean. Limited Edition# 164 of 1000. Exclusive Harrods Merrythought Mouse Pajama Bag 13"
Harrods by. 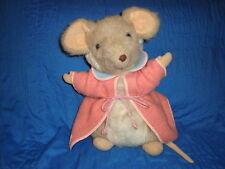 A Plush Mouse wearing a pink bathrobe. Head to toe she measures approx. 13" tall. I will do my best to answer. Made Exclusively for. Top Rated SellerBrand: MerrythoughtSize: 13in. Made of mohair. Bookelt states "The Magnet Bear The Bear that Attracs". NEW, never out on display or removed from box other than to take pictures. This bear is #113 out of 250. This bear was made exclusively for Tide-Rider. This is Cheeky Little Elephant. Cheeky's elephant ears are removable. He is mohair. Only his number still shows up. Because of this story, many children cut the topknot of their Punkinhead bears so it's rare to find one uncut as this one is. His body is made of brown mohair with a gold mohair chest and linings of his ears. I do strive to note any and all flaws, but I don't always catch everything. When you lay him down, he makes a growling sound, but the growler is not working properly. CHEEKY Beach ball Teddy Bear is a limited edition that (for once!). truly IS limited! This adorable round ball like torsolittle bear is number 61 of only 250 made! Produced in pure mohair with hand embroidered features. Made in England. No stains, no fading, no thinning mohair plush. Fully jointed. Tan felt pads. Golden Honey color. Made in England. Bear looks great. "Little Miss Mischief". Fully jointed & made in pure mohair. Limited Edition # 35 / 2000. Beautiful little bear. Like new. Limited edition. Length: 6.5"
● 2002 Tateshina Teddy Bear Museum 250 limited edition. ● Pankinhead apple. YOU still wonder BUY it NOW?. 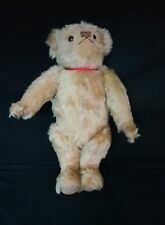 What a Fabulous Vintage Plush Stuffed Teddy Bear by Merrythought! Description: Sweetest Little Honey Colored Bear Jointed Arms, Legs and Head Adorable Face Approx. 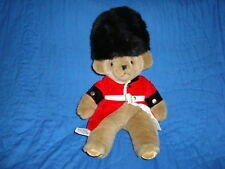 11" Tall Condition: Excellent; with no issues Tagged: Merrythought Made in England. IS THIS BEAUTIFUL HARROD EXCLUSIVE MOHAIR BEAR MADE BY. THIS BEAR STILL HAS THE SAFETY PIN HEART! THIS BEAR IS 17" TALL. ROYAL CYPER EMBROIDERED ON CHEST. Purest Mohair. British teddy bears make a truly special lifelong gift. 16" Head to Sole (Box- 9 " x 9" x 14 " approx.). (Exclusive for Holt Renfrew, Handpainted Eyes. 2) Made in England for Holt Renfrew, on leg. I do strive to note any and all flaws, but I don't always catch everything. This little character is Limited Edition# 211 of 250 and in very nice condition. I don't feel it's a flaw, but I took two pictures of his hat where there's a small section of double stitching that makes it stand out to the eye. Glass eyes, velvet paw pads. He is made with dark gold, short mohair. N ever owned. As with most Cheekies, he has bells in his ears. "Cheeky Little Easter Egg". Cheeky is known for having a bell sewn into his ear. This adorable little cheeky Easter Egg. gold & brown mohair. Produced in pure mohair with jointed head and arms. He has a stitched nose and mouth and is fully articulated. Excellent condition. The ribbon on the hat has slight colour fading. He has felt pads with hand stitched nose and pads and is fully jointed and growls. Veritcal stiches on nose and shaved snout. I do strive to note any and all flaws, but I don't always catch everything. This little bear is in very nice condition and stands 8" tall to the top of his hat. Pure Mohair. Arms, legs and head are jointed. Made in England. Rupert Bear is Limited Edition# 1611 of 10,000. I do strive to note any and all flaws, but I don't always catch everything. The light amber eyes, embroidered brown nose, felt paw pads with stitched pads and shaved pointed snout are all in excellent shape. A green ribbon is tied in a bowtie around his neck. What a wonderful collectible British Bear! Merry Thought Mohair GOLD MICRO CHEEKY Bear Made In England. Condition is Mint in box. Shipped with USPS. He has felt pads with hand stitched nose and pads and is fully jointed and growls. Also includes original bag. "Sunshine" The Summer Bear Merrythought Mohair Limited Edition Signed Bear. This bear is 449 of 1000. In beautiful condition. Does have some light scuffing on eye. (see photo) All items sold AS IS so please ask any questions before committing to buy as all sales are final. Thank you! I do strive to note any and all flaws, but I don't always catch everything. He's in very nice condition, except for a small stain on his bow. The wind-up music works! "Ancestor of Cheeky Clown". Limited Edition # 94 / 500. Fashioned in a combination of pure mohairs. Fully Jointed, Tide Rider Stone Pure Mohair, unique Hand embroideredfeatures. by Award Winning Artist Jacaueline Revitt. Fully Jointed, Pure Mohair Angel with Purple wings-- Joy to the World Banner. He is hiding his face with a slingshot. When I did a lot of research, this bear is usually holding his slingshot behind his back looking guilty. THIS version looking remorseful with slingshot covering his eyes is very hard to find. Magnet Bear MAG10MI. Limited edition No 654 of 2000.